Provided photo Katherine Huffman and Joyce Frass at a Miami County Republican Women packing party to pack stockings for Miami County men and women serving the country in the Armed Forces. Provided photo The Miami County Republican Women held a packing party to pack stockings for Miami County men and women serving the country in the Armed Foces. Front is Sophie Kemmer, and in the back from right to left are Katherine Huffman, Joyce Frass, Carol DeHart, Lou Holter, Rita Hollenbacher, and Barb Wilson. Provided photo The Miami County Republican Women will be sending out over 80 Christmas stockings filled with treats, knitted hats, and toiletries to Miami County men and women serving the country. MIAMI COUNTY — The Miami County Republican Women decided to raise some Christmas cheer for local natives who are currently away serving the country in the Armed Forces. The group will be sending out over 80 Christmas stockings filled with treats, knitted hats, and toiletries to Miami County men and women serving in the military to share the Christmas spirit with them over the holiday season. 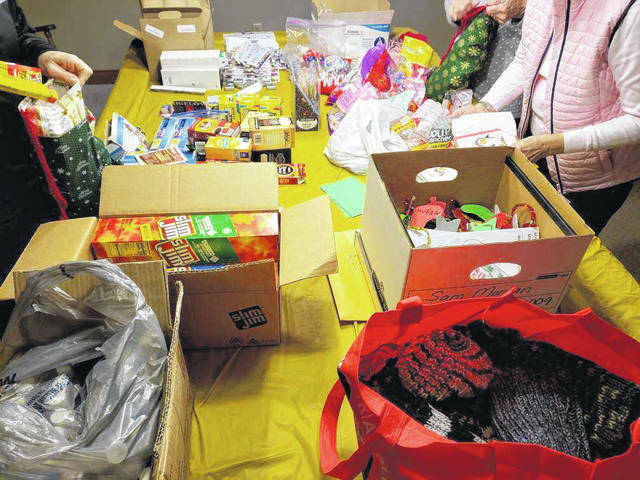 “We wanted to brighten Christmas for a Miami County resident who is serving our country,” said Rita Hollenbacher of the Miami County Republican Women and committee chair for the project. Joyce Frass and Katherine Huffman were also a part of the committee for this project. 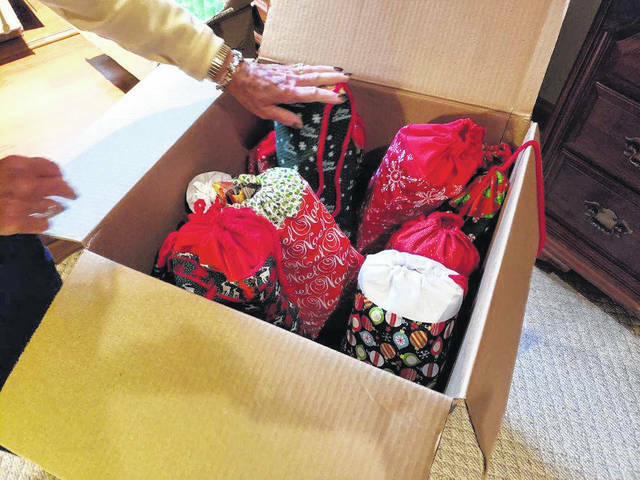 Hollenbacher said that she got the idea from people involved in Operation Shoebox, which sends shoeboxes and stockings packed with goods to troops who are deployed overseas or are returning to the country. “I thought … we could do that,” Hollenbacher said. Hollenbacher introduced the idea to the Miami County Republican Women in June, and they have been working on the project since then. 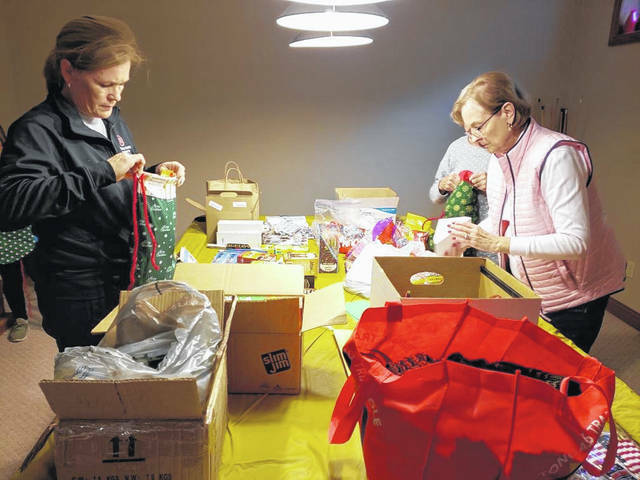 The Miami County Republican Women sewed over 80 stockings out of Christmas and other festive fabrics and gathered various items to put in the stockings, including protein bars, hard candy, tissues, emergency Mylar blankets, toiletry kits, knitted hats, and more. They collected a number of items from other community members and businesses, too, as Conagra donated beef jerky and the USO donated toiletry kits including toothbrushes and toothpaste. “Decks of cards were donated,” Hollenbacher added. Approximately 60 hats were knitted for those serving in cold climates this winter, and Hollenbacher said that many of those knitted hats were made by non-members of their group. “We had Christmas cards and ornaments … made by schoolchildren,” she said. Some of the packages will be headed overseas to units in Germany and South Korea, while others will be headed to those in training in different states, such as South Carolina, Texas, Georgia, Missouri, and Florida. One of their packages will also be headed to northern Ohio to someone serving in the Coast Guard on Lake Erie. Tribute Funeral Home in Greenville will be paying for the postage, Hollenbacher said. The Miami County Republican Women hope to make this an annual project. “People were grateful to do it,” Hollenbacher said. https://www.dailycall.com/wp-content/uploads/sites/30/2018/11/web1_Christmas-stockings-2-cmyk.jpgProvided photo Katherine Huffman and Joyce Frass at a Miami County Republican Women packing party to pack stockings for Miami County men and women serving the country in the Armed Forces. 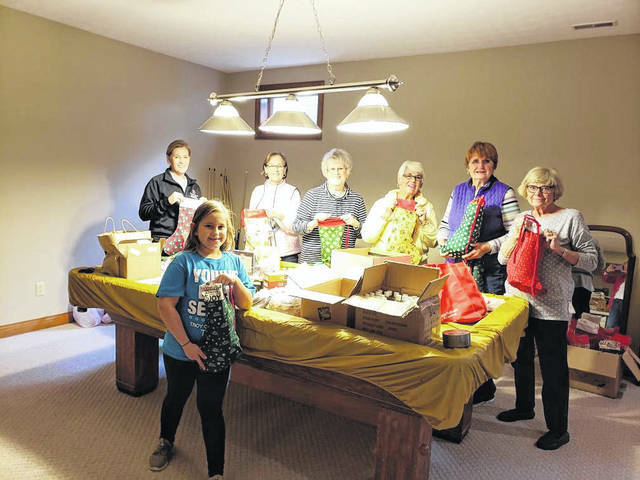 https://www.dailycall.com/wp-content/uploads/sites/30/2018/11/web1_Christmas-stockings-1-cmyk.jpgProvided photo The Miami County Republican Women held a packing party to pack stockings for Miami County men and women serving the country in the Armed Foces. Front is Sophie Kemmer, and in the back from right to left are Katherine Huffman, Joyce Frass, Carol DeHart, Lou Holter, Rita Hollenbacher, and Barb Wilson. https://www.dailycall.com/wp-content/uploads/sites/30/2018/11/web1_Christmas-stockings-3-cmyk.jpgProvided photo The Miami County Republican Women will be sending out over 80 Christmas stockings filled with treats, knitted hats, and toiletries to Miami County men and women serving the country. https://www.dailycall.com/wp-content/uploads/sites/30/2018/11/web1_Christmas-stockings-4-cmyk.jpgProvided photo The Miami County Republican Women will be sending out over 80 Christmas stockings filled with treats, knitted hats, and toiletries to Miami County men and women serving the country.